Heat oil in a small skillet. Add onion and cook over med-high heat until softened, 2 min. Add garlic. Add tomato paste. Stir all together, approx 3 min. Set aside and allow it to cool. In a large mixing bowl, add turkey, egg, Italian seasoning, panko, spinach, basil, and cooled onion mixture. Mix until well combined but don't overmix. Using large ice cream scooper, form about 10 meatballs. Roll them into neat balls. Grease 12 cup mini muffin pan. Drop meatballs into cups of pan. In empty cups, fill with water for even baking. Place in oven for approx 40 mins or until nicely browned and cooked through. In the meanwhile, prepare balsamic ketchup. Slice bread. When meatballs are done, take pan out and set oven to broil (place rack near top). Line sliced bread on large baking sheet covered with aluminum foil. Add meatballs and top with cheese. Bake until cheese has melted, approx 1-2 minutes. 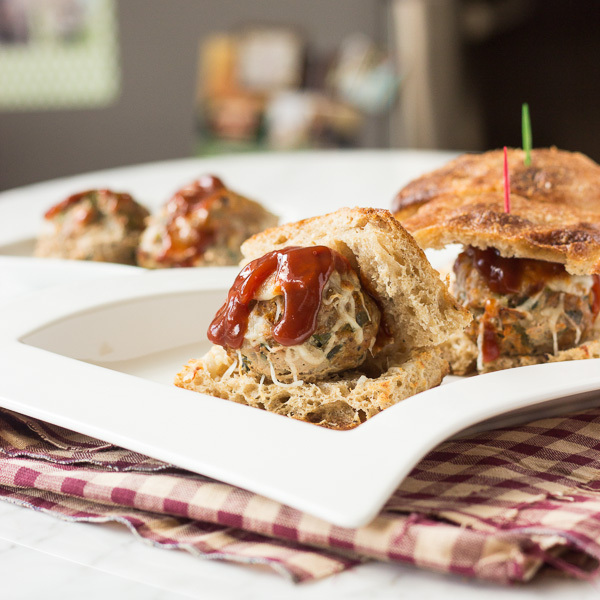 Top meatballs with ketchup. Cover with slider tops. Serve while warm. 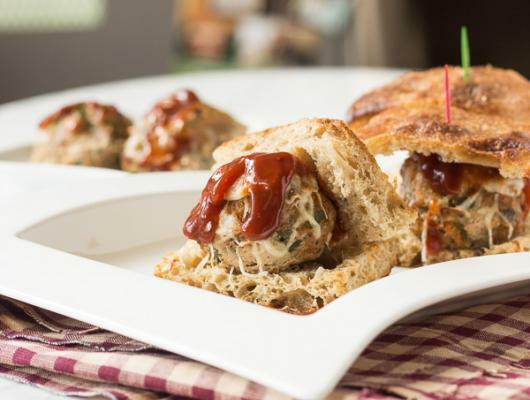 Italian turkey meatballs with spinach and basil are baked in the oven, topped with generous amounts of balsamic ketchup, and can be enjoyed as sliders or added to various dishes such as spaghetti. It can just as easily be consumed as is.